GridIron Flow is a groundbreaking application—there has never been anything like it. This visual workflow manager uses a simple interface to show you important information about your projects and keep you organized. It's like an operating system upgrade for users of creative software, as if Mac OS X's Spotlight feature suddenly began tracking the relationships between your files and the amount of time you spend working on them. How does it do this? Flow creates a map that shows a flowchart of how assets from one application are used in another application's documents. It also shows files that were exported into other formats and exactly where all those files reside. For the first time, you can effortlessly see critical information about every related file in a project. Flow also saves revisions of your files, so you can revert to previous versions. And it tracks the time you spend actually working on each document, which makes billing for your time much easier. For example, you can easily recover an earlier version of a Photoshop ( ) image that you used in an Illustrator ( ) document, which you then placed into InDesign ( ), exported as a PDF, used in a Flash ( ) animation, and then placed into a movie—just by dragging the final movie file onto Flow. Or you can find an original text file after it was placed into an InDesign document, exported to PDF, and subsequently included in a PowerPoint ( ) presentation. After launch, Flow operates in the background. It analyzes each file in order to track it to wherever you may import, export, or place it. It watches when you move files on your hard drive and it invisibly keeps original documents when you save over them. The first time Flow runs, it may take overnight to scan all your documents for links, but even before that, you can drag any file onto its icon to generate a map on the fly. After the initial scan, Flow's demand on your Mac's processor is minimal. Flow keeps its maps and deleted files in a folder (named FlowData) at the root level of your hard drive. If you use Time Machine to back up your Mac, you'll want to add that folder to Time Machine's list of folders to ignore. A flyout menu lets you perform all kinds of actions on a file. Note that you can package (collect) all the files related to all the documents related to the current one. You can collect every asset within every asset used in a chain of files. If you had dragged an unrelated file onto the map (for example, an Excel spreadsheet), it too would be included in the package. Note that Flow displays all the fonts and colors used in a document. The red color on the Fonts list indicates that some of the fonts are not currently active. To see which fonts are not active, just click the disclosure triangle. Flow works with almost every kind of creative-output file type: Adobe Creative Suite software formats, video and sound editing applications from Adobe and Apple, Microsoft Office, 3-D apps, AutoCAD, CorelDRAW, Painter ( ), text files, and even random files you choose to associate with a project—just drag them onto a document in Flow's map to connect them. Most creative applications keep track of the files you've linked to each document, and can collect those linked files into a package. But let's say you create an illustration, and then you use it in a multitude of projects and export it in a multitude of ways. Flow can reveal everywhere that file was used as part of another file—even if it's exported to PDF, Flash, or a movie. This is handy and valuable. Here’s a scenario that happens every few minutes somewhere in the world: Your client wants to swap out a photo in all the places it's been used in multiple projects. Flow lets you instantly see all the places that photo was used so you can calculate how much time it will take to universally replace it. There is no other way to do that in one step. 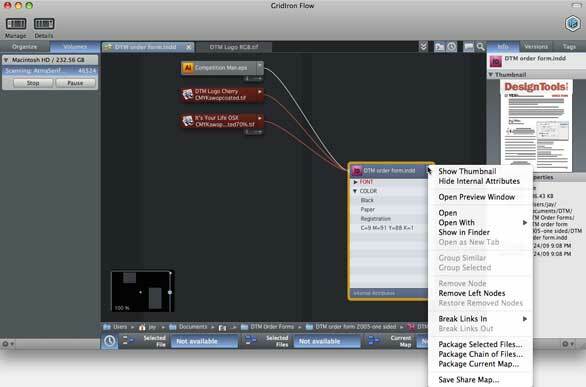 Flow can also do its magic for cross-platform workgroups. If you place its Share Map onto a dedicated file server, Flow keeps track of every change made and everyone will see updates to the map as they appear. Speaking of seeing updates, Flow can display a floating map, visible inside Adobe's Creative Suite 4 applications, that shows all the other documents that depend on the current file, all the versions of that file, time spent working on that file, and more. The map updates in real time as you work. Yet another floating window warns you as you use the Finder to move or delete files that are used by other files. One major limitation is that this version of Flow does not support QuarkXPress ( ) or Photoshop Lightroom ( ). GridIron says it’s planning to support these creative pro apps in the very near future. It also doesn't track research time spent on e-mail or browsing the Web, both of which you may want to include in your billable hours. Flow can give you reports on exactly how much time you spent actually working on specific documents. Flow can even report all the time spent on a set of connected documents, and it doesn't include your idle time. You can automatically generate a report every day or week, and export it for use in a spreadsheet. 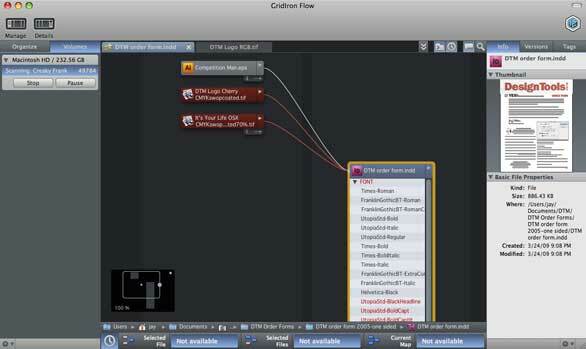 GridIron Flow 1.0.1 is a valuable asset manager that easily delivers hard-to-gather information. It's especially helpful for creative pros who tend to repurpose files for a variety of projects. Because of its value to workgroups, the company has priced it accordingly: $299 for one copy, or $399 for three copies. At $133 per user, I believe Flow will save users time and money. Flow worked exactly as advertised. If your workflow does not include QuarkXPress or Lightroom, I recommend it now without hesitation. Otherwise, wait for the next revision, which should support those apps.